Stephenson’s Warmlite of Gilford, N.H.
Part 14 in an ongoing series highlighting Northeast-based gear companies. Jack Stephenson was a pioneer in outdoor equipment. In the 1950s, he was one of the first to use lightweight nylon fabrics in tents and down sleeping bags, replacing the cotton and polyester materials in common use at the time. He developed some of the first tents that featured arched poles. He introduced the world’s first padded waistbelt in the early 1960s, a full decade before it became commonplace in other styles. He also promoted the benefits of vapor barriers, creating an entire line of vapor barrier clothing. 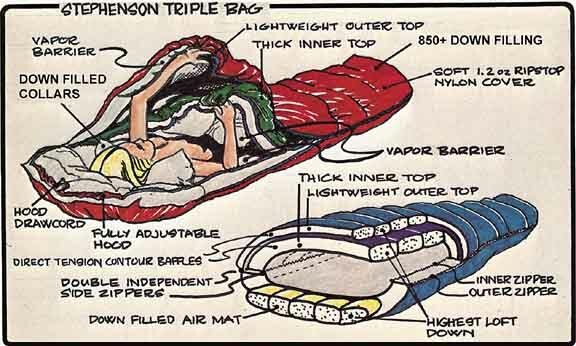 use 800+ fill down and include several innovative and unique features, including an integrated vapor barrier liner and a wrap-around zipper that allows you to fully separate the top and bottom layers, or join them together to create a large down quilt.